Coconut cream is an ingredient that is used often in Skinnymixer recipes. It is a fantastic dairy free alternative for use in many dishes such as curries, soups, sauces and desserts. 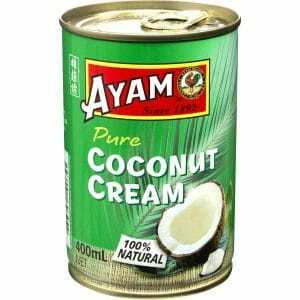 Our preferred brand is Ayam Coconut Cream as it contains 100% coconut kernel and comes in a BPA Free lined tin. Other brands can have a high concentration of water (up to nearly 40% water content) and may contain preservatives and sugars, this can have a really big impact on the success of your recipe. Some recipes may use the type of Coconut Milk that comes in a UHT carton, but that will be specified in the recipe. If the recipe just says Coconut Milk – it will refer to the type that comes in a tin. You can also use Coconut Cream in place of Coconut Milk just by using some of the cream with some water. If you are unable to use Coconut Cream or Coconut Milk due to an allergy or if you just simply don’t like the taste, you can replace with dairy cream or milk. Other coconut milk alternatives could be almond or seed milks. For recipes that use a larger amount of coconut cream or coconut milk, you may want to consider cooking something else as it adds to the flavour of the dish ie. Thai Green Chicken Curry or Coconut Curried Sausages.